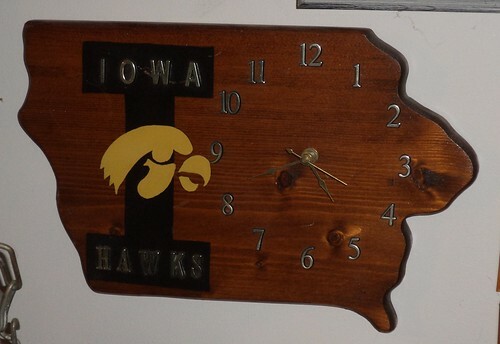 I've had this clock for years, decades even. This was handmade by a guy who lived in my hometown. It was a Christmas present years ago to us from my parents. I have it in the living room and, when the power goes out, I always know the time because it runs on a single AA battery. Two weeks ago, I came home from work and it was 2:25. Well, that wasn't right so I replaced the battery and fixed the time. Monday I came home and it was stopped at 1:55. I replaced the battery again, although I thought I'd put in a fresh battery, but you know how that goes, and fixed the time to what you see above. Nothing happened. The second hand didn't move. Now this battery I know is fresh because I got it at Christmas. So, I have to think something has broken within the clock mechanism itself. There are some things you'll fix forever and this is one of them. I looked at the mechanism and I know I can get these at JoAnn or Michaels craft stores. I wonder how simple it would be to replace the mechanism. I need to go to JoAnn anyway if I'm going to make valentines for the valentine exchange. I can look at clock mechanisms at the same time. Has anyone ever replaced a mechanism? Is it easy to do? It seems kind of silly but I sort of feel lost without this clock keeping time in the living room.